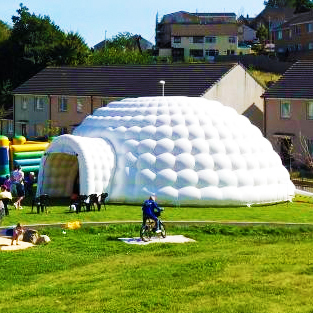 Igloo Discos are perfect alternatives to an event marquee hire; inflatable venues are unique pop-up structures for your next corporate, team building or exhibition event. Jaw dropping, exclusive and eye-catching are a few common descriptive words used to describe our Igloo Discos. 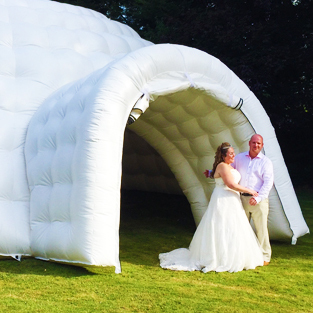 If you are holding an event that needs the wow factor start with an igloo disco. Our Inflatable Igloos are the largest of our range of inflatable venues, standing at 12.5m x 12.5m & 16.5m x 16.5m with a capacity of 350 guests standing. Fun Leisure stocks a variety of inflatable igloos and pop up marquees. Catering for a maximum of 350 guests, suitable for a broad variety of events. 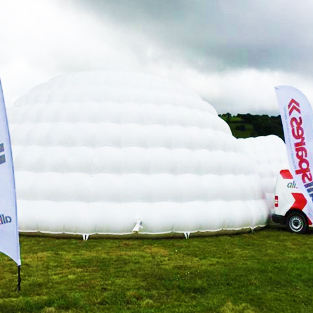 All of our inflatable structures are fully waterproof and provide eye-catching pop-up venues for your next event, whatever the weather. Previous events Igloo Disco's have been seen at including private outdoor weddings, focal points for team building days, DJ tents for festivals and exhibition space alternatives at trade shows.